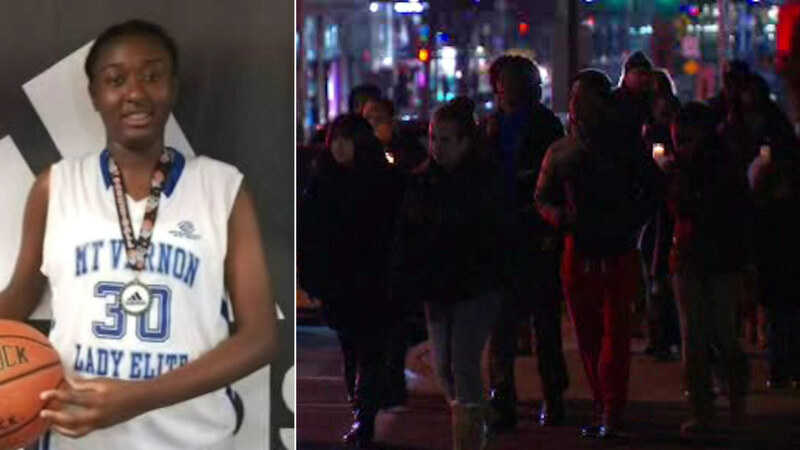 MOUNT VERNON, New York (WABC) -- A Westchester County community in mourning came out on Wednesday night for a candlelight protest against gun violence after a teenager was recently killed by a stray bullet. Family and friends of 13-year-old Shamoya McKenzie began with a candlelight vigil outside the Mansion nightclub in Mount Vernon and then silently marched to City Hall to attend a council meeting. The group attended the meeting to push for more police officers on the streets to help combat the continuing gun violence in their community. McKenzie was shot while she was in a car on the way home from practice for the Mount Vernon Junior Knights basketball team on New Year's Eve. "One of the things that one player said was Shamoya did everything right, she was good in school, she didn't hang out, she didn't do that, and she still got killed," said Dwayne Murray, the director of the Mount Vernon Junior Knights Basketball program. McKenzie had dreamed of one day playing for the UConn women's basketball team, so on Tuesday they made her an honorary member and sent her family a jersey with her number 30 on the back.